It's just over 3 years since I took up residence in my new studio. It seems as if it was only a few months ago.... how quickly time flies! 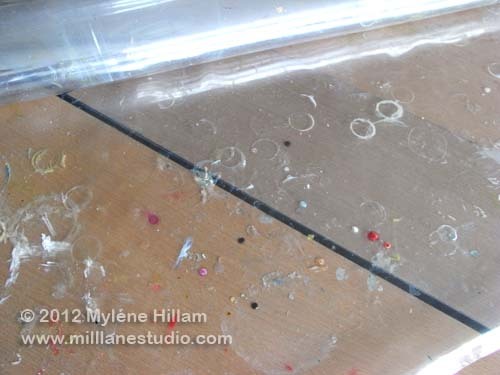 The biggest evidence of how long it's been is the protective plastic cover on the workshop tables. They've been subjected to dozens of resin workshops, hundreds of papercraft and jewellery projects and a fair bit of gift wrapping in that time. They've taken abuse from heat guns, resin spills, attacks by scissors and pliers and just general day-to-day wear and tear. This is just a small section and although it isn't clear in the photo, all those pretty spots of colour are lumpy bumpy spots of resin..... it was becoming difficult to find a level area to work on. So today, it's out with the old and in with the new. It's lovely to have a nice clean, level surface to work on again. But now it's time to set up for the next resin workshop so we can Christen it! FUN! The new covers look great! 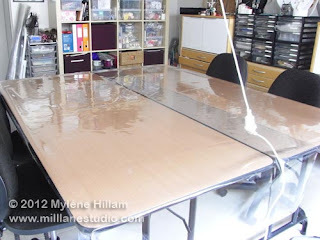 Do you use a heavy plastic or something like plexiglass? I've used a heavy plastic that you buy by the metre/yard. It's a little bit thinner than 1mm thick. It's not cheap but it is certainly durable!